Proper functioning of glucose metabolism in our organism is dependent mainly on the effective activity of insulin, which is influenced by such aspects as obesity, diet, drugs and lifestyle we lead. In supplementation there appeared a new weapon in the fight with insulin-resistance, the development of which leads to diabetes type II. Berberine, as it is a substance we are talking about, belongs to the compounds which are called protoberberines and its effect is based on the content of an isocholine alkaloid. Berberine has gained popularity thanks to its strength of effect, which is identified with the effectiveness of metformin. 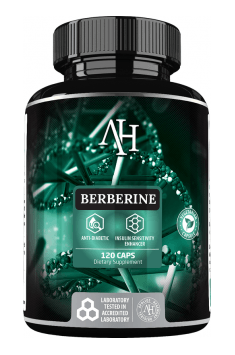 Our most recommended berberine supplement - Apollos Hegemony Berberine will surely help in losing weight! Berberine mainly works to facilitate insulin metabolism by more effective utilization of glucose by the organism. Moreover, by the specific enzyme AMPK, which effectively activates and regulates the work of metabolism, improving the utilization of energy substrates. The effect supporting the sensitivity of tissues to insulin makes the supplementation work against insulin-resistance. This function effectively helps in the treatment of diabetes, prevents the reactions of glycation and also secures the intestines from the breakdown of sugar in their area, taking care about their functions and health. Thanks to the effect supporting glucose functions, it generates hopes regarding the support in the treatment of diabetes. In scientific studies with the use of berberine it was concluded that the amount of 1500 mg daily, administered in 3 portions, 500 mg each during the day, exhibited similar biological effects to the effect of the drug metformin (Metabolism, 2008; 57: 712–7). The above activities effectively promote the fight with obesity, support the utilization of energy substrates, modify metabolic rate and fat oxidation. Moreover, these effects also influence the hormones responsible for the utilization of fats for energy purposes, supporting their proper utilization during effort, which is related to regulating hormones responsible for their storage. Biological effect of berberine effectively supports the organism in antibacterial, anti-diarrheal and anticancer activity. Apart from the preventive effect against diabetes type II, it additionally supports lowering cholesterol and helps to reduce blood pressure. Some sources suggest that supplementation also supports the fight with depression, which is related to the support of the proper function of intestinal bacterial flora. Interestingly, the product does entail any side-effects. The only contraindication is the occurrence of neonatal jaundice or the diseases of the digestive tract that may have more intensive symptoms during supplementation. Supplementation with berberine will work well during the periods of fatty tissue reduction, making it possible to increase sensitivity of cells to the effect of insulin. This means that its support during this period will contribute to more effective reduction of the so-called “love handles”, the appearance of which is related to the activity of insulin. Additionally, berberine may exhibit a positive effect during the periods of carb loading, making their utilization for the purposes of filling up glycogen supplies more effective and improving the effectiveness of sugar metabolism. This effect may be successfully used in the periods of building dry muscle mass to make the organism use energy substrates in the form of carbohydrates in an optimal way, which will ensure effective utilization of carbohydrates by tissues, minimizing the risk of storing adipose tissue. The dose of 300-400 mg daily is considered to be the amount, which exhibits preventive effect. This means that this type of dosing should effectively supports glucose utilization. The amount of 1000 mg daily exhibited effectiveness in lowering cholesterol level and the change in the ratio of HDL to LDL lipoproteins. The dose of 1500mg exhibited strong effect lowering the level of sugar in blood. This amount was divided into three portions during the day. On the market of supplementation, berberine appears in the form of HCL, containing a pure form of alkaloids or in the form of plant extracts. The source of berberine in the extracts are: common barberry, goldenseal or mahonia. The application of berberine shows strong effect supporting the functions of glucose-insulin metabolism. Its activity effectively lowers the level of glucose in blood, supporting the fight with insulin-resistance. Thanks to increasing sensitivity of cells to the effect of insulin, it effectively supports the utilization of glucose for energy purposes. It may be successfully used during fatty tissue reduction or building pure muscle mass, as a form of protection from storing fat.